This past weekend we hosted the 2013 Quantified Self Europe Conference. Over 275 self-trackers, toolmakers, scientists, and enthusiasts came together to collaboratively learn about creating “self knowledge through numbers.” It was an amazing conference that featured over 100 different presentations that included insightful show&tell talks, thoughtful breakout discussions, rapid-fire Ignite talks, and inspirational plenary presentations. We’re currently processing all the videos from the conference and will be posting those soon. Until then we thought it would be nice to highlight all the great posts, videos, and pictures that our community has been putting together to document their QS Europe Conference experience. Don’t Life Log Me: Quantified Self 2013 in Amsterdam by Hans De Zwart. The Great Memoto Experiment & Quantified Self Conference Recap by Kitty Ireland. Our conference videos from the many different Show&Tell talks and our Plenary presentations are coming online. Look out for them on the conference video page. Danielle Roberts: The focus in my art is on creating awareness. Daniel Gartenberg: 76% of people track something. At the moment I track my mood. We had some amazing photographers among our attendees who have graciously placed their beautiful images in the 2013 Quantified Self Europe Flickr Group. 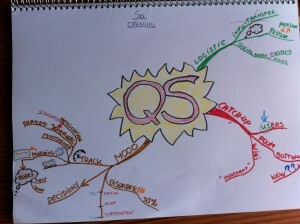 Also, check out these awesome mind maps from Wimme Klaver! Thanks to everyone who participated, volunteered, spoke, shared, and made our conference an experience to remember. We can’t wait to see you all again!